Perfect balance between speed, distance, and stability. Bunch of safety features that makes it the perfect choice for your kid. As a parent you want your kids to be safe. But you know you'll give in after a while. Well, no need to argue anymore. This is by far the most worry-free hoverboard experience you will get as a parent. Recently Segway went ahead and launched not one, but two new additions to their Mini-series. The Segway MiniLite is a cheaper less advanced version of the MiniPro which is aimed at kids 6 years and up to 180lbs. The other addition, Segway MiniPlus, is the more advanced model of the family that boasts some completely new features. Segway’s own pitch for the MiniLite is: “A safe and fun alternative to hoverboards.” Can’t agree more there. The MiniLite has the same sized inflatable tires at 10.5” which gives you the comfortable and trouble-free ride that you’re looking for when buying a Segway unit. 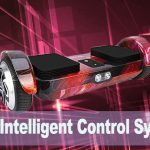 Segway has been the leader in self-balancing technology for years and lately, they have been starting to create unique and much more advanced hoverboards like the MiniPro and now comes the MiniLite. The Segway MiniLite is a stripped down edition. Stripped in price and with less performance than the MiniPro it still provides superior quality and riding experience over the normal hoverboard units. Seeing it is more stable than its competitors and the turning is a lot smoother by using a knee-pad instead of having to twist your ankles to turn it provides its user with a much more comfortable riding position and a feeling of safety. Even an inexperienced user can learn how to ride this hoverboard within minutes. Those of you who have read through many of our reviews know that I love the larger units, especially the ones with pneumatic tires since they provide that extra stability, a bit of suspension to the ride, and handles most terrain much better. For me living in Sweden, 10”+ pneumatic tires are a must-have during the winter months. It’s seriously the best time of the year to be riding a hoverboard if you ask me. So, you can hear it on the name Mini “Lite” that this is a lighter edition and not only in weight but in performance and price. They’ve gone ahead and created a cheaper version that still boasts the incredible handling of the Segway, just at a price-point where most people can afford one. 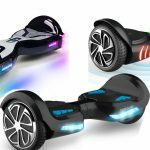 It posses the latest technology by Ninebot, a set of two powerful in-wheel/hub motors at 350W. It can take you up to 11 miles on a single charge and get back to full charge will never take you more than 3 hours tops. It has a great top speed of 10 miles per hour. Keep in mind that Segway is all about user experience and the balance between speed, range and stability is fantastic. Finding that exact point where you will provide your user with enough power to go up steep slopes while still feeling secure enough they won’t fall off isn’t an easy task, but Segway just keeps on delivering that feeling of security. It has the ambient tail-light features that let you set the color and mode for your tail-lights. The automatic headlights provide you with good visibility no matter what time of the day you choose to ride. It is a light unit weighing only 26lbs. With the detachable knee-pad you which also works as a handle you can easily take it with you. Personalize to perfection with the Segway by Ninebot mobile app which lets you check speed, distance, change LED colors and much more to make it your best ride. The MiniPro was never intended for children and with the MiniPlus being even less appropriate. Segway launched the MiniLite. A well-balanced unit that is easy to use and it caters to the lightweight users of the family, your kids. The limitation in speed that can be set within the mobile app and the fantastic stability and security of the MiniLite will sure give you as a parent, less to worry about. However, there are no hoverboards that can provide you with a worry-free parent experience, but this is as good as it gets.